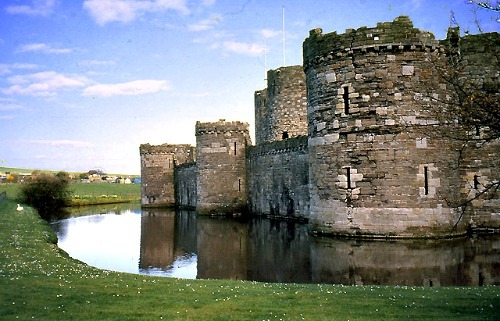 Beaumaris castle was built by Edward I as part of his plans to conquer north Wales. Planning started in 1284 but construction was delayed due to funding, but the castle was deemed a necessary expense after an uprising by the last recognized native prince of Wales. Building began in 1295 but the castle wasn't completely finished for many years due to Edwards invasion of Scotland diverting funds from the project, which stopped construction. After an invasion scare in the year 1306 work began again and the project was finally deemed finished in 1330 after a total of £15,000 was spent on it, which was a massive sum of money for the day, but the castle still had parts which weren't built to the original specifications due to the financial situation. The building was a massive project and employed over 2000 workers to build it, one of the biggest construction projects in Wales in its day. The castle has also seen its fair share of troubles in its life, with the first being its capture in 1403 by Welsh forces led by Owain Glyndwy, but they only held it for 2 years until Royal forces took it back in 1405. The castle also saw some troubles in the English civil war when it was held by Forces loyal to Charles I, though they only managed to hold out for 4 years until Parliamentary forces stormed the castle. It fell into ruin shortly after the English civil war and became part of a local stately home during the 19th century. Since to 21st century the castle has been managed by Cadw who today have the castle open as a tourist attraction. Beaumaris castle is home to an unknown number of ghosts as the spirits who linger here rarely reveal themselves, making it very difficult to get an estimate. The chapel is said to be the hotspot of the castle, with many visitors claiming to hear the faint sounds of chanting and intense sudden cold spots. There has also been a large number of recordings of this chanting, with people capturing sounds on various devices they did not hear in person. The corridors are known as an uncomfortable place to be, with a very strong feeling of being watched and followed when passing through them. As for the rest of the castle a strong sense of loneliness can be felt throughout, almost as if the emotion has lingered from the castles past, possibly from the years it was besieged. The only other report of the castles hauntings is the sounds of distant screams coming from empty areas. These screams have been heard by many people and have been reported for a number of years. Who is responsible for these sounds is unknown, but their pain filled screams have scared many a guest within the castles walls.